The toilet flush valve is a key element in the toilet tank. The flush valve is not at fault very often. The toilet flapper can cause the toilet to run intermittently or not flush correctly. Before you assume it is the flush valvem make sure the flapper is not the culprit. See the article on 'Toilet Flapper Repair' for more information. Not sure what your problem is, see 'How To Fix a Toilet' to troubleshoot your problem. It includes a fill tube and the flapper and water inlet for the toilet bowl. Most replacement kits include a new gasket for the tank and bolts to hold the tank in place. You will want to replace the flush valve if the seal between the tank and the bowl is leaking and does not respond to tightening. Or if the flapper will not seat even after being replaced. Is your problem a leak at the bottom of the toilet tank? 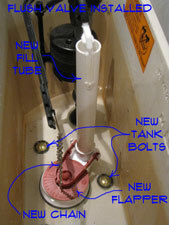 You will want to try to tighten the bolts holding the tank in place first. Check out the article on Toilet Leak Repair for more information. Replacing the flush valve is more work than a typical service call. The initial call will be $50 to $100. If it takes longer than the initial time period (this varies), they generally charge you in fifteen minute increments. $15 to $35 per fifteen minute period. It is unlikely that you need a new toilet if it is just leaking. Assuming a repair period of one service call plus one half hour the Savings would be from $80 to $170. Parts would be extra of course, and marked up at a repair shop's pricing. This repair requires that you take off the toilet tank. This is harder than some of the other toilet repairs. Check the toilet tank flapper first for a toilet the leaks water into the tank and runs intermittently. See the article 'Toilet Flapper Repair' for information on adjusting or replacing a toilet flapper. Replacing the toilet flush valve involves taking the toilet tank off the base. You will need to take precautions to deal with any water that may spill out of the tank when it is removed. Anything that can be damaged by water should be removed from the area before the repair is attempted. Failing to drain the tank down can generate a lot of water on the floor and surrounding area. Getting the toilet partially repaired before it gets too late or the parts store closes can leave the toilet not operating. One trick is that a toilet can be flushed by dumping a couple of gallons of water quickly into it. This emulates the normal function of the tank. Draining the toilet tank is the first thing you want to do before working on a flush valve. Toilet tanks have a lot of water in them, that can get everywhere. It is clean water, but still, it makes a mess. Turn off the water supply to the toilet first. Most tanks have a fill line marked on the side of the tank. Some do not. You can use a marker to put a mark at the correct water level if it is missing. The new flush valve tube may be a different height than the old one. With the water turned off, flush the toilet to drain out most of the water from the tank. 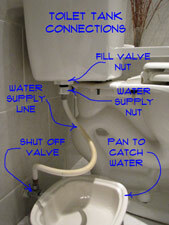 Place a pail below the nut for the toilet tank inlet. Loosen the nut on the water supply line. If the water is off, you should not get much water from the supply line. There will be about an inch of water left in the bottom of the tank. Sopping the water up with rags will be a tedious task. The best way to finish draining the tank is to loosen the nut to the toilet fill valve. Loosen the nut to the fill valve and let the water drain into the pail. Any water that you do not remove is likely to wind up on the floor. 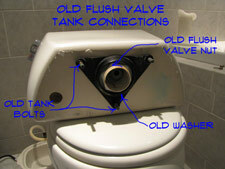 Removing the toilet flush valve will completely open up the bottom of the tank. Draining the toilet tank prior to this step is important. Removing toilet tank bolts begins with the right tools. The tops of the bolts usually take a large flat blade screwdriver. On the under side of the bolts you may find brass or plastic nuts. The plastic nuts may have wings on them that allow you to hold them with your fingers, this is nice feature. Depending on the configuration of your toilet, you might need, an adjustable wrench, box end wrench or even a deep socket wrench. You may have gotten a tool with the toilet that was used to tighten these nuts. Your builder or plumber may have thrown it away. Finding it now may be a challenge. Before you begin, try to locate wrenches that you can use on the nuts in question. The tank is held onto the base by two or three bolts that are visible from inside the tank. Many times you can hold the plastic nuts with your fingers. Loosed and remove both bolts. That's all there is to it, the tank should be free. Place a piece of cardboard on the floor and pull the tank up from the base. Lay it on it's back on the cardboard. 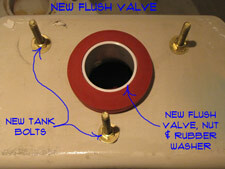 After you have removed the tank from the base, removing a toilet flush valve is pretty easy. Lay the tank on its back to see the washer and nut for the flush valve. Before you purchase a flush valve, make sure you know the size. Most of them are a nominal 3" or 4" diameter. If you are not certain, you want to take the old flush valve with you to match it up. Certain brands of toilets have proprietary flush valves that only fit that brand of toilet. This is usually only true of more expensive toilets. If you are in doubt, check the internet for your model of toilet to see which flush valve it takes. Remove the rubber washer from the base of the tank. There is a large plastic nut that holds the flush valve in place. Use a large pair of adjustable pliers to remove the nut, holding the valve assembly from the inside of the tank. Remove the tubing that is connected to the top of the flush valve tube. Remove the large nut and the flush valve should be free. 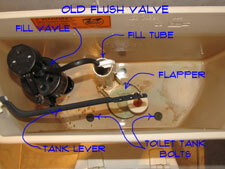 Remove and discard the old flush valve along with the flapper. You should have gotten a new one with the flush valve kit. By this time you should have the old flush valve removed. Before installing the toilet flush valve you want to get the instructions for the new one. Follow the instructions on the new valve to properly locate the washers and nut. Put the new flush valve into the tank and orient it appropriately the same way the old one was. There should be a washer between the valve and the tank, if it is supplied loose you will need to put it on. Put the plastic nut on and tighten it down. Obviously, with plastic fittings you want to exercise some caution with tightening them. On the other hand, make sure the nut is snug. If you get a leak from this connection, you will have to start all over again. Yes that is correct, you won't know unitl it is all put together and you turn the water on. Place the main seal over the outlet and push it up to the bottom of the tank. Attach the tubing at the top of the fill valve. At this point the inside of the tank should look similar to how it was when you took it apart. You may want a little help replacing the toilet tank. It is fairly heavy with all of the parts inside. In addition, it is a little awkward to handle. Put the tank back on the toilet base and start the bolts and washers through the holes. Put the wing nuts on and snug them up finger tight. Hold the wing nuts and use the screwdriver to tighten the bolts. Tighten them down evenly, switching back and forth. Do not over tighten. Make sure the tank is secure. Hook the flapper chain to the tank lever making sure that there is no slack. It should operate freely, up and down. Make sure the nut for the fill valve is snug and then hook up the water supply. Tighten the nut for the water supply line, don't over tighten it, remember it is plastic. Turn the water back on and check for leaks. First check the water supply and then the main seal. No leaks, good. The float for the tank should still be set at the proper height. When the tank stops filling, check the water level. Too low, adjust the float until the tank fills to the correct level. After that, flush the toilet. All your problems should be solved. So replacing a toilet flush valve is a little bit of work. Taking the tank off sounds a little scary at first. Once you are past that it is a breeze. One big plastic nut and a few bolts to tighten. You have to do a leak check, but that's not hard. All done, toilets works great, Good Job! This is a home repair has a higher level of difficulty. By following the instructions and taking your time you were able to do it. What's even better is that you saved some money, great.